Do you want outdoor inflatable ottoman that navy color dia 21 inch x 9 inch height portable and suit for multiple occasions? Fabritones USA LLC, A Georgia Company, brings you the Top-Rated outdoor foot stools and ottomans! These are the best quality patio inflatable ottoman you can find - guaranteed. You will love it. - Please use a suitable pump to blow the Inflatable stool up quickly, and the two-in-one valve has extra-wide openings for rapid inflation and deflation. The outdoor pouf ottoman can be used as a foot rest stool, seat or table. Perfect for changing shoes for Living Bedroom, pools, backyard patios, college dorms, decks or vacation homes. - The cloth cover has a side zip which makes it easy to change or wash. When inflated, please put the Plastic liner inside the cloth cover, and then start inflatable, when the gas is full, zip up. Machine wash or hand wash cover fabric with mild detergent, do not bleach, then let air dry. - With purchasing our Fabritones outdoor footstool, you become a part of our family and you are automatically enrolled in our 100% satisfaction guarantee program. Our #1 goal is to find you top quality deals, at great discounted low prices, and to provide you with the ultimate best customer service in the world. Shop happy & confident with our 100% money-back guarantee, you deserve it! ★PACKAGE INCLUDED - 1 x outdoor inflatable ottoman navy + 1 x Filling (25u,Thick PVC explosion-proof liner). Gift-wrapping package with PVC handle bag. NOTE TO CUSTOMERS - The package does not include air pump, please purchase it by yourself. ★EASY TO CARRY - FBTS Prime outdoor footstool is very practical and convenient to carry, special design with double string piping and handle, zipper on the bottom of the ottoman, folded design for easy portable, solid and durable. Relax and rest on the long journey, ideal for travel, home, outdoor foot rest. 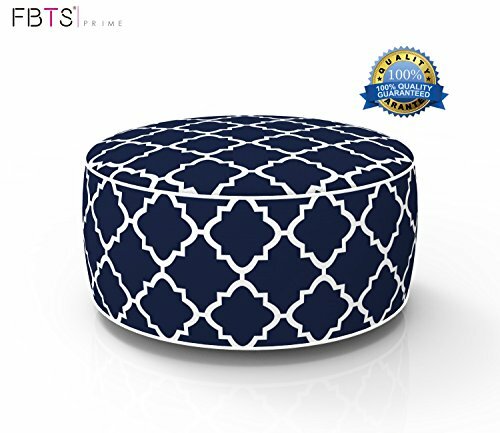 ★SAFE DESIGN - Our outdoor ottoman size is 9 inch Height 21 inch diameter, more stable and safer. Circular edgeless design is ideal for kids and adults. Bearing 300 pounds, suitable for children a variety of ravaged. Durable reinforced bottom makes it perfect for relaxing outside on your patio, deck, lawn or indoor use.